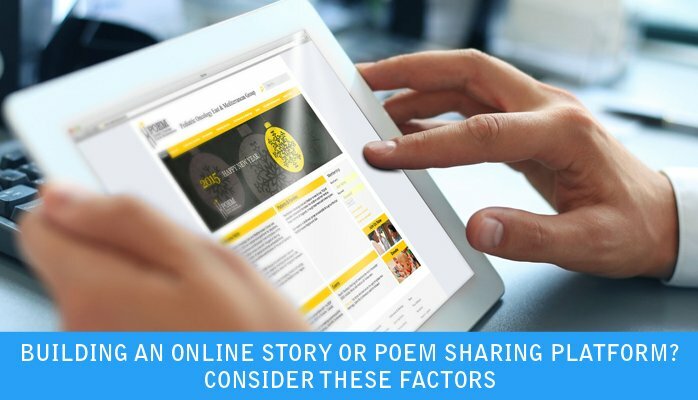 Building an online story or poem sharing platform? Consider these factors……. Poetry writing is the most artistic and liberating form of creative writing. The writing world is abuzz with one word these days—and that word is “platform.” But many writers are left wondering: What is a platform? Why do I even need one? And the biggest question of them all is how do I start building mine? Platform is a simple word to describe a complicated process—a process that’s been covered in mystery until recently. A strong platform includes things like a Web presence, classes you teach, media contacts you’ve established, articles you’ve published, public speaking services you offer and any other means you currently have for making your name (and your future works) known to your readership. The first thing you need to know and communicate is what defines you and your expertise. If you don’t know who you are and what you uniquely offer, how will anyone else? Think of this as cultivating your identity. Rather than the overused and impersonal term “branding,” identity nods to the importance of keeping things real and staying true to you, even while making self-promotion a priority. With your identity in hand, how are you different from all of the other writers out there? These days, you have to communicate who you are and what you do quickly. Attention spans are getting shorter, so being able to summarize your strengths concisely is critical. Platform isn’t your set of credentials or your résumé; it’s current and evolving on an ongoing basis. As what you write about grows and changes over the years, you’ll need to constantly revisit and rewrite the words that describe what sets you apart from the pack. Clarifying who your readers are will bring your platform into perspective. If you’re vague about identifying your audience, the whole writing process takes longer and typically requires more rewriting than if you zoom in from the get-go. This applies to books, blogs and everything else you write, no matter the form or genre. Once you identify your audience and start speaking to it directly, the ongoing dialogue will spark all kinds of ideas, connections and opportunities to catalyze your relationship over time and create community. The beginning of a story must grab the reader’s attention, orient her to the setting, mood and tone of the story, and introduce her to a protagonist she will care about, even worry about, and emotionally invest time and attention into. If readers don’t care about your protagonist, they won’t care about your story, either. This crisis that tips your character’s world upside down must, of course, be one that your character cannot immediately solve. It’s an unavoidable, irrevocable challenge that sets the movement of the story into motion. At the climax of the story, the protagonist will make a discovery that changes his life. Typically, this discovery will be made through wit (as the character cleverly pieces together clues from earlier in the story) or grit (as the character shows extraordinary perseverance or tenacity) to overcome the crisis event (or meet the calling) he’s been given. The internal discovery and the external resolution help reshape our putty person’s life and circumstances forever. In one of the contradictions of storytelling, the reader wants to predict how the story will end (or how it will get to the end), but he wants to be wrong. So, the resolution of the story will be most satisfying when it ends in a way that is both inevitable and unexpected. Research five or six professional associations related to your topic, target audience or professional goals. For example, if your topic is the magic of botanicals, your audience is gaming enthusiasts, or your ambition is to become a published author, conduct an Internet search of groups that cater to gardeners, gamers or aspiring authors. Then narrow down your selections to the three that make the most sense for your goals. Once you’re a member, get in touch with the administrators and introduce yourself. Ask how you can become fully involved. Take advantage of appropriate opportunities to share your breaking professional news. In a year, assess how well each group benefits your career. Volunteers are smart. They know that helping out feels good, and when you feel good, everything goes better than it would if you resided on feeling nervous or self-conscious. There are countless literary event volunteer opportunities around the country. So volunteer—especially if you don’t have the means to participate in the kinds of events and programs you’d like to. It won’t hurt. In fact, it will very likely help by putting you right in the mix. Professional writers understand that speaking and selling books go hand in hand. And though not all professional writers choose to become professional speakers, many do. Certainly, if you want to spur awareness of a book, speaking on your topic to groups ranging in size from tens to hundreds is a smart choice. The benefits of having a solid platform abound. Increased media exposure, blog buzz, invitations to speak, fully enrolled classes and a surge in readers can lead to career opportunities such as interest from agents and editors, book deals, increased book sales and, ultimately, higher income from multiple sources. In the short run, making the decision to start becoming more visible is the first step toward long-term literary success. Once you establish a platform, it can work for you 24/7, reaching readers even as you sleep. Platforms take time to establish, not to mention considerable energy to launch, but in the end they raise you above the pack. So make a commitment to building yours. Carve out daily time, seek out more resources on the topic or integrate platform development accountability into the format of your existing writing group. By getting off to a solid start, you’ll conserve time and energy in the long run. And be sure to pace yourself—you’ll be working on maximizing your visibility for the rest of your career, or at least as long as you plan to write.